A blog in partnership with: International Union Against Tuberculosis and Lung Disease (The Union), Action on Smoking and Health (ASH), Union for International Cancer Control (UICC), Vital Strategies, Southeast Asia Tobacco Control Alliance (SEATCA) and NCD Alliance. The international community is preparing to endorse a new Global Strategy for Tobacco Control to help governments battle the tobacco epidemic. We cannot afford to waste this unique opportunity to help save more lives. Governments around the world should support this carefully drafted and cost-effective plan. For more than a decade, countries around the world have worked under the umbrella of the World Health Organization Framework Convention on Tobacco Control to end the tobacco epidemic. They have implemented tobacco control measures to reduce tobacco use and the harm it causes to the health of their populations. Most people have now become familiar with the warning that tobacco use is harmful to their health but countries face enormous obstacles in ending the tobacco epidemic. Many countries and philanthropies have invested in tobacco control activities over the years – a sign of their commitment to ending the tobacco epidemic. But funding levels are insufficient given the size of the problem. Tobacco use kills more than 7 million people every year and costs the global economy more than US$ 1.4 trillion according to the World Health Organization. The window of opportunity to stop the tobacco epidemic is quickly closing. Tobacco use will kill one billion people this century, if we don’t act now. In October, countries from around the world will consider a carefully drafted, cost-effective Global Strategy for Tobacco Control, to help countries step up national efforts to stop the tobacco epidemic. By endorsing the plan at the upcoming Eighth session of the Conference of the Parties to the WHO FCTC, countries will commit to take action on a few time-bound priorities. The plan also provides a template to help countries mobilise new funding to fast-track national tobacco control efforts by 2025. Tobacco use is a risk factor for noncommunicable diseases (NCDs) including cardiovascular diseases, cancers and chronic respiratory diseases. To protect future generations from these immense risks, countries can closely model their national tobacco control plans on the new global strategy and its cornerstones. Progress in reducing tobacco use and harm has been slow because governments have faced many obstacles in translating their commitments into policy action at country level. Chief among common challenges is a lack of sustainable funding for tobacco control activities. 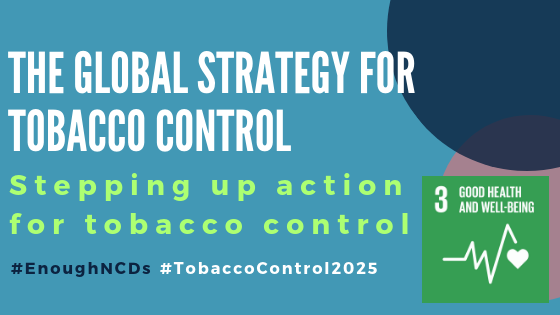 The year 2018 presents a unique opportunity to get behind a new global strategy for tobacco control which identifies clear priorities, where resources allocated for tobacco control activities will likely have the greatest impact in reducing tobacco use and harm. In addition to being slow, global progress in reducing tobacco use and harm has been uneven because of the levels of complexity in engaging sectors beyond health in policy development and implementation. For example, in-country tobacco control focal points need the help of high-level policymakers and politicians to secure resources in national budgets. The new global strategy for tobacco control helps countries continuously improve their national tobacco control plans by identifying and learning from the success stories of other countries’ tobacco control efforts. Beyond a lack of sustainable funding for tobacco control activities, countries must continually protect their public health policies from the undue influence of the tobacco industry. Individually, most countries are no match for an industry replete with cash and resources. The new global strategy for tobacco control will help countries achieve policy coherence nationally, internationally, and across all sectors. This will be possible because governments can focus on a few priorities, where they will achieve the greatest results and protect the integrity of the progress made in stopping the tobacco epidemic. The scale of the tobacco epidemic requires international cooperation to implement the recommendations outlined in the WHO FCTC and the clear priorities defined in the new global strategy for tobacco control. The WHO FCTC already has a track record of uniting governments and other non-state actors to battle the tobacco epidemic. 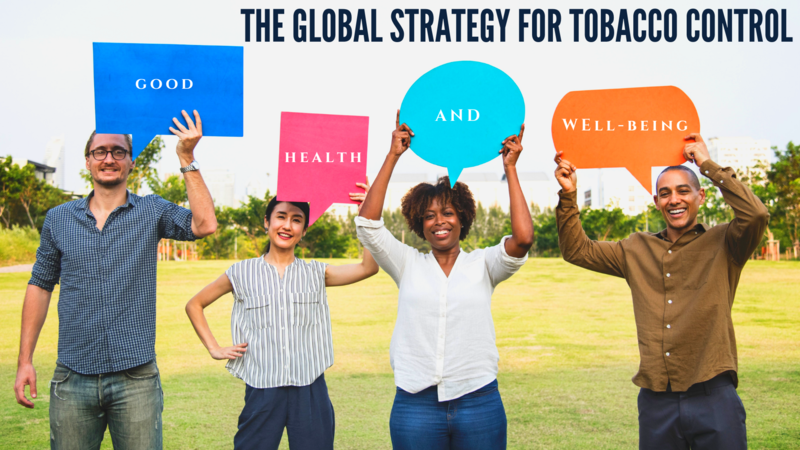 For the next few years, the new global strategy will continue to build on the good will of the international community to help coordinate all ongoing tobacco control efforts. This October, countries can take a giant step in stopping the tobacco epidemic. When they endorse the proposed Global Strategy to Accelerate Tobacco Control at the Eighth session of the Conference of the Parties to the WHO FCTC, they can start working right away on a few priorities. We cannot afford to waste a unique opportunity to save more lives.